Here is the India startup world news monthly roundup for January 2019. Now you can know in and out of the happenings of the Indian startup world that took place in the month of December 2018 in this monthly capsule. – Sequoia Capital is launching a startup accelerator with an investment folio of around $100 million. It will pick up 10-20 early stage startups twice every year and shall invest around $1.5 million in each firm. – TrueBil, an online marketplace for used vehicles, has raised Rs.100 crores in a Series-B round of funding from Japanese investor Joe Hirao. It has so far raised Rs.160 Crores in funding. – Country Delight has raised around $7-10 million in a Series B round of funding led by Matrix Partners. The online milk delivery industry is said to have an addressable market of $1.2 billion, out of which only 8-10% is currently online. – Kalaari Capital is likely to raise its fourth India focussed fund of $200 million this year. The VC firm has not raised a new fund since 2015. Kalaari Capital has investments in Urban Ladder, Curefit and Myntra among others. – IIFL Asset Management has raised Rs.950 crores for its IIFL India Private Equity Fund. The fund will back professional entrepreneurs at multiple stages. – SoftBank is set to invest $400 million in FirstCry for around 40% stake. The deal will value FirstCry at $600-700 million. – Apax Funds has invested $200 million in Fractal Analytics. The current round of funding values Fractal Analytics at around $500 million. – Turtlemint Insurance has raised $25 million in a fresh round of funding led by Sequoia Capital. Turtlemint offers technology platform for insurance agents. – WayCool, a tech-enabled supply chain platform for fresh produce, staples and dairy products, has raised Rs.120 crores in equity and debt from impact investors. The firm wants to use funds for expansion and technology strengthening. – Danone is leading an investment of Rs.182 Crores in Indian yogurt maker Epigamia. Danone had exited from dairy business in India about a year ago. – Pepperfry’s existing investors Goldman Sachs, Norwest Ventures and Bertelsmann India are considering to invest another $100 million into the firm. The funds will help Pepperfry to diversity and expand its offline presence. – Muthoot Microfin has raised Rs.562 crores through securitisation. The firm has raised around Rs.1,300 Crores through securitisation since April 2018. – Ola has secured $74 million in fresh funding from its existing investor Steadview Capital at a valuation of $5.7 billion. With this funding round, Ola regained its No.2 ranking as India’s most valuable startup. – Eruditus Group has raised $40-million in a Series C round of funding led by Sequoia Capital. Eruditus plans to use the funds to expand its operations to China and Latin America, as also introduce more courses in AI and ML. – Shreyas Shibulal, son of Infosys co-founder SD Shibulal, has set up a Rs.140 Crore fund dedicated to clean-energy startups. The fund will undertake seed investments. – Matrix Partners India has raised a new fund of $300 million. It plans to expand its current investment team and invest in early-stage startups across emerging sectors. – ChrysCapital has closed its eighth fund at $850 million, taking its total assets under management to over $4 billion. – InnerChef has raised $6.5 million in pre-Series B round of funding. It will use the funding to strengthen Healthie. It claims to have raised $10 million so far. – ZoloStays has raised $30 million in series B round of funding led by Nexus Ventures, its existing investor. – Due to the scalability of AI startups, Google Launchpad’s India accelerator programme will continue to focus on them only. Applications for its second class were opened last week. Google has indicated that in future, Google Launchpad may backup agriculture and healthcare technology too. – CarDekho raised $110 million in a Series C round of funding from its existing investors at a valuation of $400-500 million. – Fractal Analytics is said to be in advanced talks to raise around $200 million from Apax Partners. Fractal works as a strategic analytics partner to several Fortune 500 companies with its 1200 consultants across 15 locations. – Venture capitalists may be eyeing late-stage startup deals in 2019. Startups scaled up faster in 2018, leading to bigger funding rounds. – Zomato is reportedly looking to raise another round of funding between $500 million to $1billion. It has so far raised $635 million and is valued at $2 billion. – Qualcomm Ventures aims to back Indian startups in sectors like healthcare, financial services, mobility-tech under its recently-launched AI fund of $100 million AI fund. The firm has backed startups such as Portea, Ninjacart and YourStory. – Sidbi has said that only Rs.1900 Crore, out of the total Rs.10,000 Crore set aside for Startup India initiative has been committed to VCs by the end of December 2018. 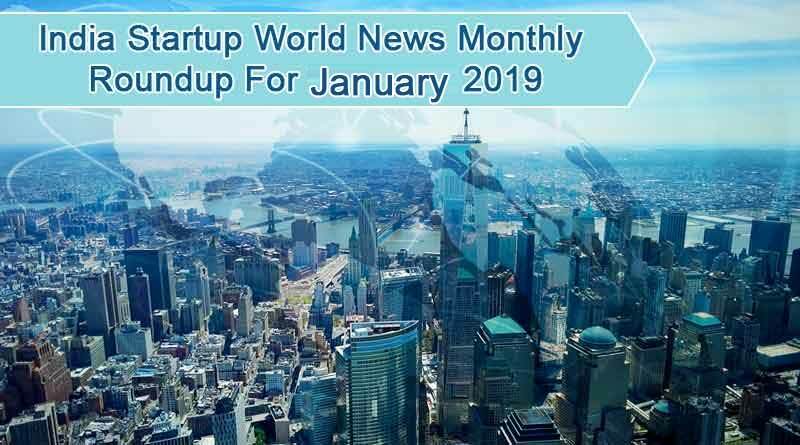 For more articles like India startup world news monthly roundup for January 2019,Do Subscribe to our newsletter and follow us on Facebook, Twitter and Google+ for more interesting articles.